After getting the Citizen Titanium EcoDrive AP2470 and the Atlantic Seacrest automatic I also got the Casio Sea Pathfinder Tough Solar SPS201 and while the 3 wristwatches could hardly be more different I decided it might be an unusual but interesting exercise to directly compare them! The Citizen Titanium EcoDrive AP2470 is a quartz watch with a case and bracelet made of titanium, with analog (=hands) display, with a perpetual calendar and with solar recharging; the Atlantic Seacrest automatic is a mechanical wristwatch in the Swiss tradition (this one is gold-plated and quite elegant) while the Casio Sea Pathfinder Tough Solar SPS201 is a digital quartz, quite tough and also solar! The visibility is quite an interesting point among the three watches - in normal light things are good for all of them - maybe with a very small disadvantage for the digital Casio (where the virtual display on the LCD has a slightly smaller angle of perfect visibility than phisical "real" hands) and some people will give a very small advantage to the very simple analog display of the Atlantic automatic while others would like more the better contrast of the Citizen Eco-Drive (the silver hands on black dial definitely provide better contrast than golden hands on champagne dial, but the Eco-Drive also looks more "busy" with 6 hands). 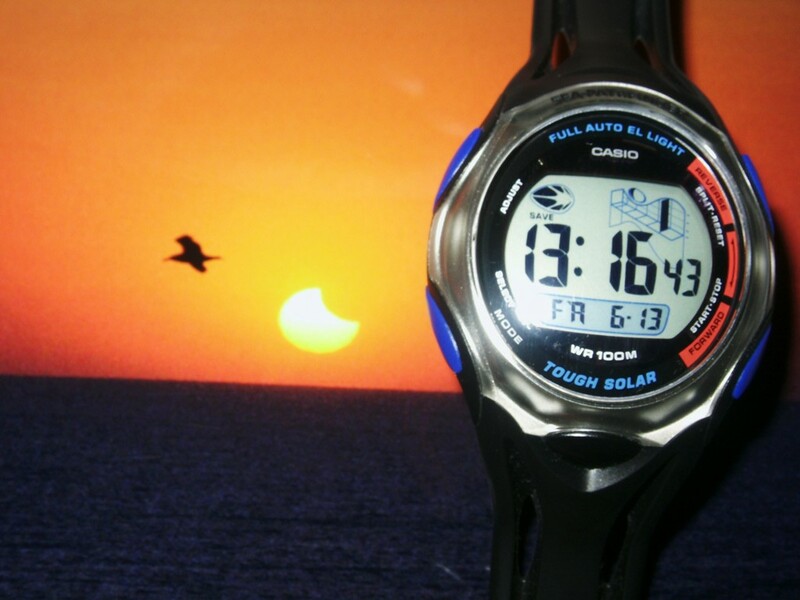 The Casio is also the only of the three with a curved crystal - that might be a small disadvantage when taking a picture of it "on land" but might be very handy under water! The accuracy is another interesting story - after two small "manual corrections" made by myself on the ETA 2824-2 I have now a very decent automatic inside COSC limits - but that does not change the fact that in the fastest position it can gain in a single day the same 5 seconds error that either the Casio or the Citizen will only reach in a month or more :) Both quartz watches will be around 1-2 seconds/month if always worn (with a small advantage for the Citizen at +1 over the Casio at -1 or -2) but amazingly the Casio will keep almost the same precision even with frequent termic changes (like when you wear it on and off) while my EcoDrive will worsen to around + 4-5 seconds each month! The Atlantic is an automatic watch with around 42 hours of power reserve (but only during the first 36 the accuracy is good) and with no power reserve indicator - which basically means that I have to wear it every second day at least - since I don't have a winder - yet :) That is quite typical for automatic watches - even for very expensive models - and would normally be no problem if that was my only watch. The Citizen Eco-Drive also lacks a power reserve indicator - but with a full charge it will actually last about 90 days (which is more than one degrees of magnitude better than the ETA 2824), and unlike an automatic watch (which you need to wear or put on a winder) a solar watch will only need some light - like for instance from a window - in order to recharge its batteries. But the clear winner here is the Casio - not only it is the only one from those three with a power reserve indicator - even if it is not a precise one - but with all power-savings activated it will be able to keep the time for almost one year even from a hidden box :) That is however a "no-usage" scenario - in real life without a lot of backlight it will be more like 6 months but with very frequent use of the "auto EL" it might only last 1-2 months, which is still very much if we think about how bright that backlight is! Both the Citizen and the Casio are a huge step forward in terms of features - both are pretty much "perpetual calendars" (a feature that will cost at least 5-10 thousands dollars in a pure mechanical watch) - and for an analog watch the Eco-Drive is quite very impressive - even if it is rather primitive in setting the leap year (and has no way to read it back) it still has a way to show the current month, has a 24 hours indicator (small but usable), has a nice chronograph and it even has a decent alarm! All those features (plus the "day of the week" indicator, which I value A LOT) are also present in the digital Casio - but most people already expect that kind of advanced functions from any digital watch - so the Sea Pathfinder might only impress those people with the tide and moon functions, the very advanced countdown timer, the 5 alarms (one with "snooze", plus optional brightness alarm and hourly signal) and the second time zone! And last but certainly not least - the "auto EL backlight" which is quite nice. Surprisingly the titanium Citizen is the heaviest of the three - in large part since it is build like a tank and has a very solid bracelet - but in absolute terms it is not a very heavy or very large watch, it is "just right" for a solid one! 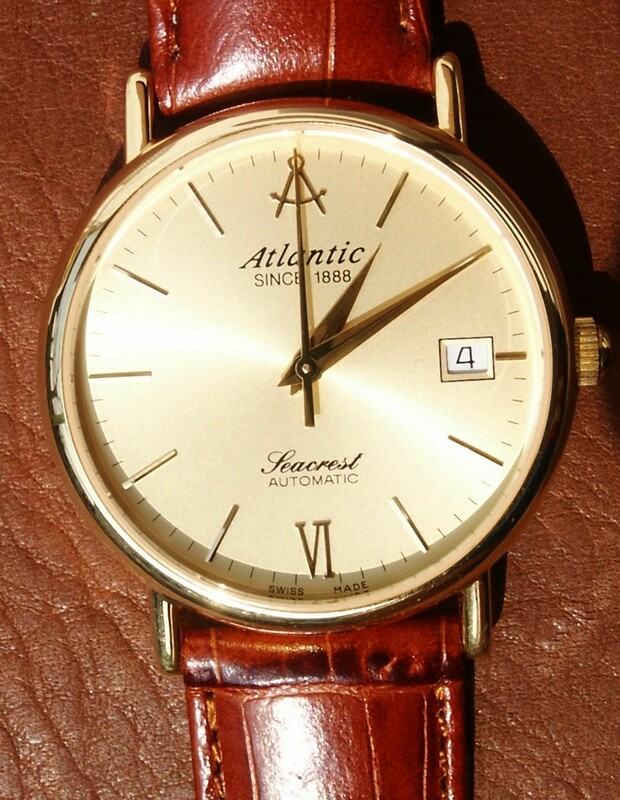 (about 42 mm in diameter) The Atlantic Seacrest is slightly lighter - mostly a result of the smaller/elegant size (38 mm) and the leather band - while the Casio is the largest (50 * 44 mm) yet the lightest of the group - and quite by a large margin!!! The build quality is very good for all three watches - that might sound a little surprising since the Citizen and the Atlantic were 5-10 times more expensive but it is also a result of the specific design of each model - with the cost-effective plastic and the acrilic crystal from the Casio actually providing a very advanced protection for shocks at the expense of much easier "scratching"! 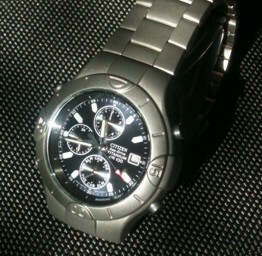 It is interesting to note that the titanium and the mineral crystal from the Citizen represent a large step forward in terms of resistance to scratching but not necessarily resistance to major shocks - and that only the Atlantic has a really scrach-proof sapphire crystal (but a less scratch-proof golden plating and even lower shock protection). The dial on both analog watches are almost perfect for as far as I can see with the naked eye, and that is even more impressive on the mechanical watch where the minutes hand can be perfectly aligned with markers on the dial (on the Citizen the steps for the hands are much more visible - that is a common problem of ALL the analog quartz watches that I have seen and actually Citizen is among the best from this group). The titanium Eco-Drive and the gold-plated automatic are pretty much in the same price range (200-400 USD after the usual discounts) while the Casio is definitely in the "under 100$" price range, and actually you can easily find them under 50 USD. With that prices I consider each and every one of those watches a great value for the money! The Casio might also last over 10 years but it will certainly require some re-polishing of the plastic crystal every 2-3 years, and eventually replacing the band might not be very cost effective and might actually be the main "retirement cause" - but considering the price even with only 4-5 years it might be the best deal of all three! For me the Casio is the easiest to wear - especially when the humidity and temperature is high - since it is very light and the band will make a very reduced skin contact (I like to wear all my watches in a very loose way). The titanium Citizen comes second and the Atlantic is only third. 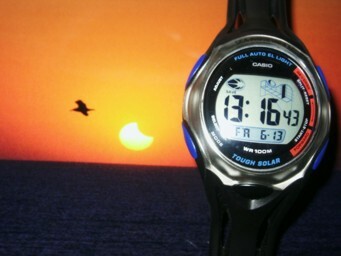 I also like to wear the Casio during night / sleep - the auto backlight is very, very nice especially with the large display! On the other side the Atlantic is my "special one" - not only I like the simple and very elegant champaigne dial (which can be a bright point in a cloudy day) but I also love the sweeping seconds hand, the perfect alignment of the hands, the sapphire cristal and the fast 28800 bph tick. The main weak point of the Casio is the scratch-prone crystal, for the Atlantic the short power reserve and for the Citizen my wish is also a sapphire crystal. There is no "clear winner" - and there can not be one since each watch has its pluses and minuses. However I also consider the Casio (which I wear at night or when I go swimming or for other sports) the best value for the money of all three - but maybe because of the smaller price I also see it as somehow easier to replace!